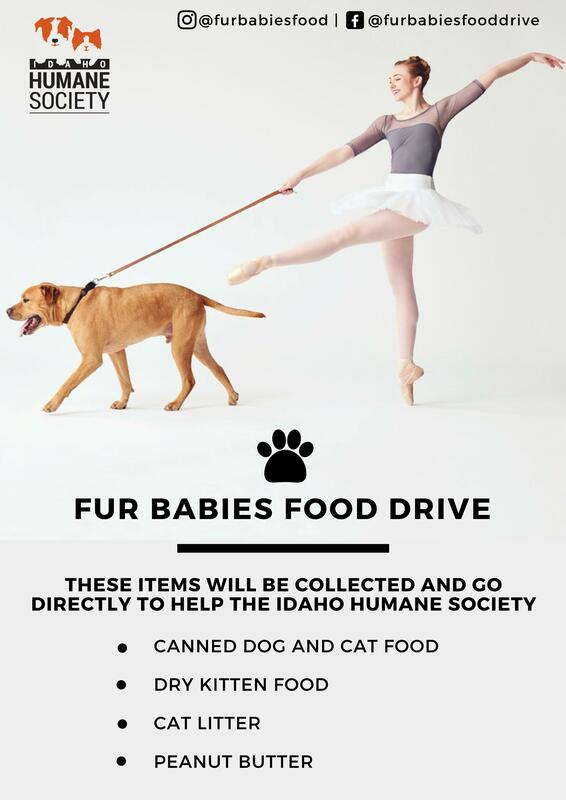 Dance Unlimited is partnering with a local organization, Fur Babies Food Drive, for the month of February to spread love by donating food to local dogs & cats in need. Throughout the month of February, we will be collecting pet food to be donated to the Idaho Human Society Pet Food Pantry. With your help, we can make a large donation to the pantry that assists with shelter animals and their meals, medication administration, kennel enrichment and various other needs. The donation bin can be found in the studio lobby. 2) Dry Kitten Food. Why? Kittens have very fragile stomachs, so the handlers use dry kitten food, grind it up, and add KMR (kitten milk replacer) for the most benefits to small kittens. 4) Peanut Butter. Why? They use peanut butter to help with “kennel enrichment” for the dogs. The handlers put it on the wall to distract them during vet checks/vaccinations, stuff Kong toys and freeze them for something to chew/lick while in their kennels for extended periods during the day. Provides “Meals on Wheels” home delivery to elderly citizens who are homebound. They serve around 70 homebound seniors a month that they deliver and distribute food to (around 1,000 pounds a month!). Provides a place where low income families or individuals who have fallen on tough times can get food rather than surrendering their pets because they can’t afford to feed them. Provides food for animal fostering program. Any amount helps so if it's a can of food or a case of peanut butter, the Fur Babies will benefit. To learn more about Fur Babies Food Drive, like their FB page and Instagram. We feel that this is a wonderful way for dancers and animal lovers to give back to the community. What better way than to help animals in need? Thank you for your contributions and we can't wait to see the art of giving in action at our studio!